I was relieved so many of you expressed your fondness for Avatar: The Last Airbender (the animated series, not the live-action movie, of course) when jefbot was putting the DVDs on for the Cornfather a few strips back, since it sparked the delirium going on in today’s strip that I had such a fun time drawing. Hopefully, jefbot won’t dwell in his own mind for too long – I think brushes with madness can be okay, as long as you don’t make a habit of it – especially since he’s going to have to figure out what to do with the apartment (should he stay or should he go?) now that the Cornfather has moved out. And no, Musashi didn’t miraculously show up in the hamster cage in today’s strip. Longtime readers may remember that, before he was abducted, Mu had a co-habitator of his own named Yuki, who’s still keeping the home fires burning, apparently. Also, fans of jefbot’s ferret will be happy to see Abraxas back in the strip, too. Needless to say, this strip was supposed to go up on Tuesday and it didn’t happen; drawing and coloring new characters and backgrounds always seems to take way more time than it should. If all goes well, though, Friday’s strip should be up on time. 1. Thank the gods, you’re not dead! 2. Loving how your Appa looks, definitely should be a wallpaper! 1.) nope, not dead! just been crazy busy, and this strip took longer than expected. 2.) thanks, F_F! if i get a few more requests, i’ll try and get a wallpaper up for you guys. 3.) i agree. sometimes i think writing and drawing JEFbot is the only thing that keeps me from falling off the deep end. kidding. kinda. EVERYONE ASK FOR A WALLPAPER OF THIS AWESOMENESS! and, hey: nice, new gravatar! looks good. keep it up! I love the fact that Abraxas couldnt care less about bot going bonkers and is sleeping soundly. And whats wrong with calling old friends old friends? They are the best. heheh. yeah, Abraxas is pretty zonked out and paying jefbot no heed, Maryz. as usual. and “old friends” are definitely the best. but the Cornfather could detect this was unusual for jefbot to say, probably cuz he already suspected bot would be losing his mind already. Two days? The hermit-itis is right on schedule, then! ‘Bot needs social interaction, stat. Or another pet. Or Angryscarf. Abraxas! F**k yes! the waiting finally paid off. can you let him shredd another phone or a limited collectors item in the next strip? glad to see you’re pleased with Abraxas’s return, waterpistolriot. sorry i can’t deliver any ferret-delivered-destruction of bot’s collectibles or gadgets in the next strip, but that’s not to say it won’t happen in the future! This is quite possibly my new favorite strip. I would also love to have a wallpaper of the Sky Hamster with AangBot and Mabraxas. another vote for the wallpaper! happy you liked this strip so much, Destructur25, since with the new character designs and colors, this one took me way longer than usual. Avatar: The Last Airbender FTW! if they ever become available, i’ll be one of the first in line to buy one, wyverndragon. agreed, shanna: as long as bot’s losing his mind, it’s nice that (so far) he’s losing it in a beautiful, foreign land on an awesome sky hamster. and yes, it would be nice to own one of those. as for other fandoms to visit – i’ve thought about it, and it might just happen. not sure how long you all will indulge me with that, though. heheh. 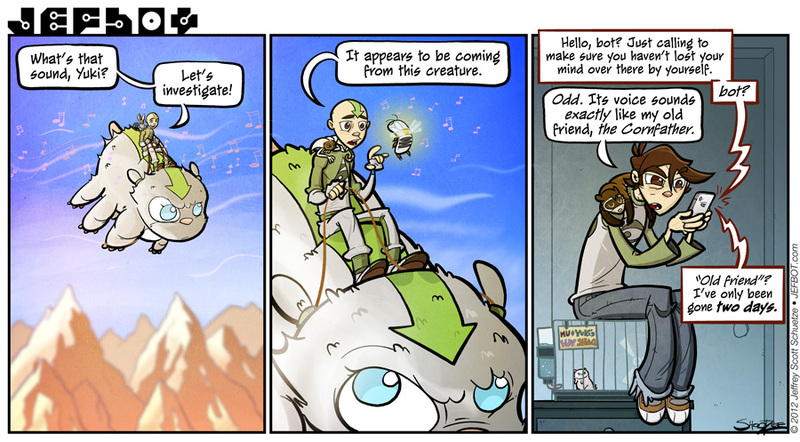 Ok ok I admit it….I don’t watch the Last Airbender thing so I don;t get any of this strip. My Geek Card is safe! Cause I know mucho other geekstuffs and what would you do with out me. Anyway, great work on the art and the colors Oh Exhaulted One. glad you liked the artwork! when you’re riding a six-legged Air Hamster: yes, Malkav! Being a shut in and close to being considered legally insane and all that. yeah, it’s been a while since Abraxas and/or Yuki made any appearances, Fijiman. they’ll be in the strip more over the next storyline or two. now that’s a show i’d like to see, Infamous Nefarious! ah there you are! nice to see you didn’t sail off the edge of the earth! Although I see jefbot already went over the edge. I just love watching bot lose his mind. oh wait thats a hamster. nope, didn’t sail off the edge of the earth, but if i had a mount like Yuki in today’s strip, i just might try it, steve! and if you like watching bot lose his mind, make sure to come back next strip, as he’ll still be going a bit crazy. and if you think this is weird, i can’t wait to show you what’s in store for the strip in the future! Good to see that your back. I hope Jeffbot is good at flying giant hamsters or else he might, uh, hit another fying giant hamster? Who knows? heh. as long as he doesn’t think too hard about what he’s doing, he should be able to fly that hamster just fine, GardeBlaze. let’s just hope he doesn’t look down or he might really lose his mind. I’m with Milady Pixie on this one. Don’t get it. Now if it was a ‘Neverending Story’ reference, then I’d be okay. But, it seems to me that JB is losing touch with reality just a bit. hopefully, you don’t need to specifically know The Last Airbender to get what’s happening in the strip, KB. that’s just there to give some fun and flavor to fans of that show. but you never know – maybe bot will be riding a Luck Dragon in a future strip! Tis a great strip today! I do love watching jefbot’s decent into madness…oh, and happy late Valentine’s Day! ha! yep, he’s back. napping on bot’s neck, as usual, dj. Awesome job, Jeff! I’m pretty sure I’d wind up in a similar mental world of fantasy if I had gone for two days without human contact, too. kinda scary how easy it is to slip into a “mental world of fantasy.” don’t you think, Soul Man? Hooboy, here we go again everybody! Jef, Bot hasn’t been eating any weird mushrooms right? nope, no mushrooms, Jiro Maeda; seems bot’s mental faculties are already hanging by a very thin thread. who knows what altering his brain chemicals with mushrooms would do!? Ah, the insanity that is caused by dear old loneliness. Isn’t it great?!?!? If insanity is like the Avatar: The Last Airbender anime, sign me up! I loved the last strip. Now, you come up with this one? How do you do it?